So it turns out I’m a Thinker. And a Doer. And a Planner. And a Solver. Last night, I was administered the learning styles questionnaire of my eldest, which had come home from school earlier on, which revealed that I was a very balanced individual. Possibly. Now it could be that I am very balanced. Or that my enormous experience and modesty mean that I have learnt to appreciate and internalise these different approaches. Or that the questionnaire is not very good at distinguishing between them. Or that learning styles is possibly unhelpful as a model for understanding individuals. 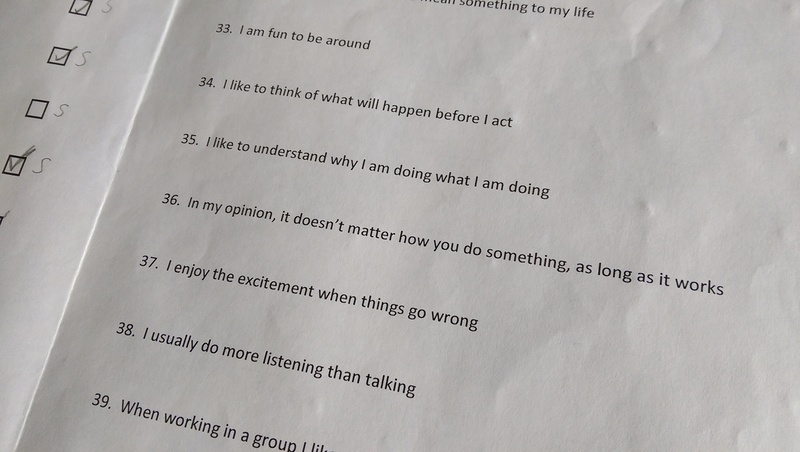 Of maybe it’s just because I didn’t tick number 33: “I’m fun to be around.” Who knows? And that’s actually the issue we confront very often in L&T: we just don’t know what we’re measuring and whether it’s meaningful. It’s easy to pock holes in a questionnaire for kids, but it’s just as common an issue in universities, where all these clever people sit around working hard to describe clever ways to resolve precisely such issues. I’ve observed before that students’ evaluations of modules/courses – which we set such great stock by in the UK – can only ever be part of judged the quality and effectiveness of our teaching. “Have we made a good impression on our students?” is a different question from “have they learnt something useful?”, yet we often conflate the two. Likewise, as has been noted on this blog many times, we talk about new pedagogies and why they’re great, without much evidence to back it up. Just because I think simulations are great, doesn’t mean they’re great, and my anecdote doesn’t match systematic research of outcomes. Partly, we have to rein in our enthusiasm and be frank about the limits to our knowledge. I think I speak for all the ALPSblog authors when I say that we talk as much about the costs and limitations of our active learning practice as we do about the benefits: beware anyone who offers you the moon on a stick. Partly, we have to go out and get that evidence. For my part, I’m going to use some of the money the nice people at the Higher Education Academy gave me to conduct some research into simulations to do just that. I’m still working on the details, but it would seem to be a worthwhile activity, on a number of levels. To return to a theme we discussed not so long ago, if we are to bring more people along with us in improving pedagogy, then we have to make the case better. You – as a Thinker, Planner, Doer and Solver – can be part of that too.